Smithwick's Pale Ale | Guinness Ltd.
Clear dark golden with 2-finger off-white head, nice retention. Taste - honey, malty, herbal hops. Medium body and carbonation, smooth, drinkable. I find this mid pack but better than BA reviews. a) Pours the hazed amber with a tan head that lasts and parades some lacing. s) Too faint and too much mass grain/malt with a bit of sweet honey and flowers. t) Also red pale sweet, grains, with that honey and floral finales that redeems it. f) Easy, smooth, but light and grainy. Session beer. Extra stout is so much better. Herbal, grassy nose with a touch of lemongrass. Light and sweet on the palate, with touches of honey, wheat, lemon, dry spice, and moderate bitterness. Fairly creamy and lively on the palate. On tap at the Waterford Waterfront Hotel. Pours amber with a thin white head that lasts. Not much aroma, but there's a little hop flavor in there. Feel is good, decent mouthfeel. Overal the Metalman is better, but this is inoffensive. For a pale ale, this is a decent beer. The color is a hazy gold with an off-white head that quickly dissipates. The lacing on the glass is decent and the carbonation is not great. The nose is a caramel adventure. Some I have worked with also mentioned a bready nose mixed with flora. The taste follows the nose an Englishesque hop experience. The malt tends to overpower the hops but for me that is acceptable because I tend to not like hops being so strong. 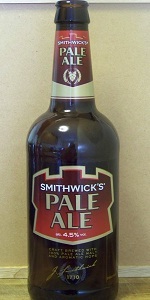 Smithwick's Pale Ale from Guinness Ltd.